In Star Wars, Luke flies an X-Wing in the attack on the Death Star. My question is, why was he allowed to fly? He had no X-Wing piloting experience. Even in WWII pilots needed at least a dozen hours flying experience before they were thrown into the battle of Brittain. 1) Only 30 fighters were sent against the Death Star; and 2) There were hundreds of other rebels on the base. For that matter, why did the rebels only send 30 ships against the Death Star? There is a deleted scene from the theatrical release of Star Wars in which the rebel leader expresses some skepticism over whether Luke can fly an X-wing. But Biggs Darklighter, Luke's friend from Tatooine, vouches for him. LEADER: You sure you can handle this ship? BIGGS: Sir, Luke is the best bush pilot in the Outer Rim Territories. Apparently, when the scene was added to the 1997 special edition, they left off even more dialogue where one of the rebel leaders reveals he knew Luke's father. This has probably been retconned out of existence, but it would provide another reason he trusted Luke's abilities. There is another scene added from the radio play that justifies the rebel leader's decision. Luke is made to fly in a simulation to prove his worth. As for why Luke was such a good pilot to begin with, I think the example of Luke's father Anakin is illustrative. In The Phantom Menace, Anakin jumps into a Naboo starfighter with R2D2 and is able to fly it because he has experience piloting racing pods. To at least some degree, it appears that flying land crafts on Tatooine prepares one for piloting small speedy starfighters. Keep in mind that Luke also has an astromech droid and targeting computers to fill in the gaps in his knowledge. As for why they only sent 30 ships, I think that's just probably all they had. The number of ships sent in defense of the Hoth base was equally paltry. Luke owned and flew a T-16 Skyhopper on Tatooine. He is even seen playing with a model of one in A New Hope. 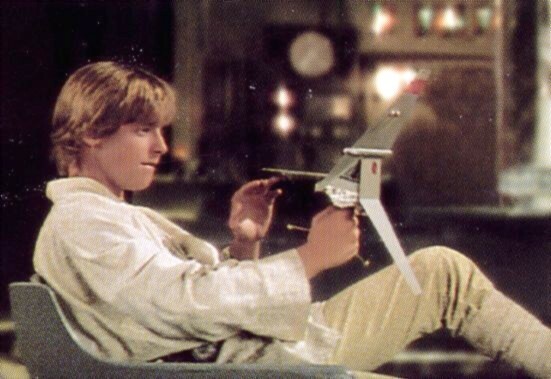 As stated in many sources, the controls for the T-16 Skyhopper were very similar to the controls of an X-Wing fighter. So much so that the rebels used them to train pilots. T-16's were a ubiquitous vehicle and therefore easy enough for the Rebels to get their hands on for training purposes, much more so than X-Wings. This has been addressed in a couple of canon sources. His impressive scores in the simulator were a major factor. His body was trembling a little, late catching up to the strain he’d subjected it to in trying to keep up with the pace of the simulator. The fatigue felt weirdly good; it meant he’d done something right and gone all out in the process. “Only because you helped me,” he replied. “When you write your autobiography, be sure to include that, okay? ‘I owe everything to Wedge Antilles’!” Wedge and the other pilots laughed. One of them wrote Luke’s name at the top of the score chart, and Luke felt pride wash over him. “Fourth flight will be led by the new kid, Luke Skywalker,” Dreis said. That was not expected. The pilots muttered and exchanged startled looks. “The womp rat kid?” Col demanded, drawing an exasperated look from Puck. They are just Rebels. They’re scrappy. They probably only had 30 ships, and by the same token, they probably didn’t have many pilots capable of flying them. It’s established that Luke is a good pilot (or at least believes himself to be), and — although I think the scene was deleted — Luke knew one of the other rebel pilots, who vouched for his ability. I guess the X-Wing is similar enough to the craft Luke had flown that he was able to handle it proficiently. In the histories of WWII that I have read, the most precious resource in air power was the air crew. Not everyone can be a pilot (the physical is very stringent), and after that it takes weeks if not months to turn the applicant into a competent pilot. The US Air Force values them so highly that there is a special forces unit whose primary role is to rescue pilots downed behind enemy lines. With automation in the SW universe, it should be much, much cheaper to build the ships, even the space-faring ones which we can expect to be much more advanced, but it still takes roughly the same amount of time to turn civilians into combat personnel. Given that the Rebellion has its back to the wall at the moment, they really don't have anything to lose, unless Luke were so hopeless as a pilot that he would be more of a danger to his squad mates as he would be to the enemy. With Biggs (as seen in some releases) and Leia (not seen, but can be presumed) to vouch for him, there's no good reason to make him sit the battle out. How did Luke become the leader in the group that destroyed the first Death Star? Why did Luke originally hate the Empire? Who are all these rebel pilots?